Last weekend was Kustom Kulture Blastoff, in Spalding. It was an excellent event with some amazing artists involved! This was the first one, and I hope this cool little event goes from strength to strength. I feel a bit sad here at camp Clumsy. It’s the end of Summer, and a couple of events and exhibitions I was working towards have now been and gone! BUT! I have some exciting things lined up! Everything is all in the early stages, so i’m not going to say much at the moment, but watch this space! Well, it’s been three days and I have just about recovered from Puttiki! The art show was great, the people were friendly, the golf was er…challenging, and the cocktails were awesome! I just want to say a HUGE thank you to Sam (aka Los Furias Tiki) for all his hard work in putting the event together. And also a massive thanks to Kessie and Joe at Hunny Lu Lu’s for plying me with drinks and entertaining me whilst I propped up the bar! If you are ever in Hastings I can definatly recommend a visit there! I also have to announce that I am officially awful at Crazy Golf! Somehow I managed to come dead last in the golf tournament. The winner gets their name engraved on a fantastic Tiki trophy made by Trader Tark. So, for next year’s loser, I will be creating the Clumsy Loser Spoon. Watch this space! Till next year! It’s only a few weeks now till the UKs number one Tiki event, Puttiki! Find out more here! 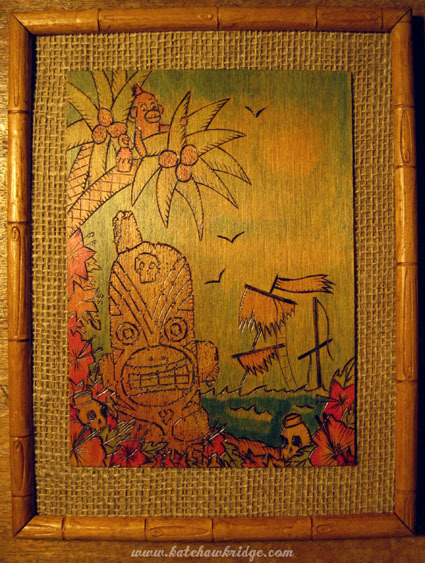 Or visit the Tiki Central thread here! And if that wasn’t enough to get you excited, here’s a sneaky peek of what I will be showing! Papergirl is an art project from Berlin. In the style of American paper-boys, rolled art pieces will be distributed by bicycle in the streets of Manchester to random passers-by. With the support of Papergirl Berlin; it will consist of an exhibition, distribution of art and a party. Manchester will be Papergirl’s UK début. If you are an artist and would like to get involved and submit work for Papergirl, visit http://papergirlmanchester.tumblr.com/ for more info. You’ll also find an interview with little old me, and some of the other fabulous artists who are taking part!